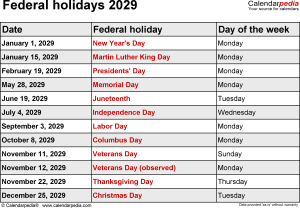 An overview of United States federal holidays and observances in 2029 as established by federal law (5 U.S.C. 6103). 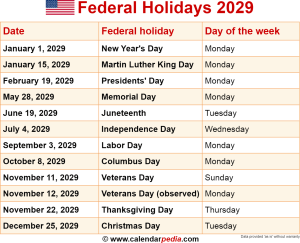 If a public holiday falls on a non-working day (Saturday or Sunday for most federal employees), the holiday is usually observed (and marked as such in the overview below) on the preceding Friday if the federal holiday falls on a Saturday, or on the following Monday if the federal holiday falls on a Sunday. Please note that the official federal name for Presidents' Day, which honors George Washington, is Washington's Birthday. The name Presidents' Day (also often written President's Day or Presidents Day) is used here because the holiday is widely known under this name, especially in states which remember additional presidents (Lincoln, Jefferson and others) together with George Washington. For more detailed information about federal holidays and other national observances see American Holidays on usa.gov.